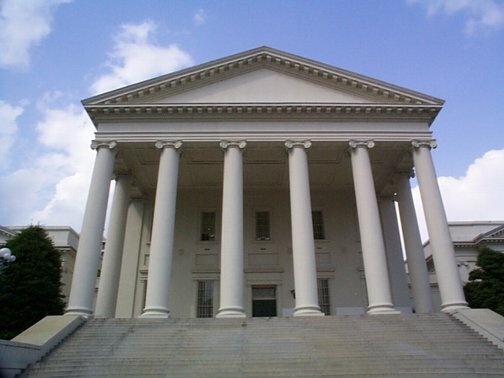 Tuesday, January 5 marks “crossover” at the Virginia General Assembly, the date when House bills go over to the Senate, and Senate bills to the House. Any legislation that hasn’t made it through the gantlet to a successful vote in its starting chamber evaporates in a puff of smoke, if it has not already died due to causes natural or unnatural. I’ve hot-linked the bill numbers to their pages in the Legislative Information Service; follow the links on the page to read the legislation or see vote results. The information below is based on what was available as of yesterday, February 3. Many of the committee hearings were recorded on video. Solar Freedom, the bill to remove barriers to customer-owned solar statewide, met implacable resistance from Republicans in control of the Commerce and Labor committees, as did narrower bills focused just on power purchase agreements (PPAs). That meant the only significant renewable energy legislation moving forward is a bill negotiated between the rural electric cooperatives and solar advocates that will ease restrictions on customer solar in coop territory. See HB 2547 (Hugo) and SB 1769 (Sturtevant), below. Two bills that would have provided financial support for solar have passed their committees, but only after the money part got taken out. A watered-down municipal renewable energy bill survives, but in a disappointingly limited form. An interesting solar-on-schools bill now looks less interesting. Legislation enabling localities to impose new decommissioning requirements on large solar farms will likely move forward. HB 2329 (Keam) and SB 1456 (McClellan and Edwards) is the Solar Freedom bill that would have removed 8 barriers to renewable energy installations by utility customers, including lifting the 1% net metering cap, removing PPA caps, and allowing municipal net metering. Advocates gave this everything they had, with hundreds of citizens lobbying for the bill and showing up at the subcommittee hearings.But Republicans held firm for their utility friends. HB 2329 was defeated in Commerce and Labor 8-7 on a party-line vote with two Democrats absent and one (Lindsay) present but strangely not voting. The Senate companion was killed in Commerce and Labor on a 10-3 party-line vote. Some of the reforms in Solar Freedom also appear in weakened form in one bill (HB 2547 and SB 1769) that moves forward—but only for the electric cooperatives. HB 1683 (Ware) gives electric cooperatives greater autonomy, including authority to raise their total system caps for net metering up to 5% of peak load. Amended to remove the net metering language, then withdrawn by patron. HB 1809 (Gooditis) follows up on last year’s HB 966 by making the renewable energy and energy efficiency provisions mandatory. If utilities don’t meet annual targets, they have to return their retained overearnings to customers. Defeated in Commerce and Labor subcommittee 3 on party-line vote, with only Democrats supporting. HB 1869 (Hurst), SB 1483 (Deeds) and SB 1714 (Edwards) creates a pilot program allowing schools that generate a surplus of solar or wind energy to have the surplus credited to other schools in the same school district. HB 1869 defeated in Commerce and Labor subcommittee 3 on party-line vote. In Senate Commerce and Labor, SB 1714 was incorporated into SB 1483, then defeated unanimously. HB 1902(Rasoul) would provide a billion dollars in grant funding for solar projects, paid for by utilities, who are required to contribute this amount of money through voluntary contributions (sic). Killed in Appropriations subcommittee on party-line vote. HB 1928 (Bulova) and SB 1460 (McClellan) expands utility programs allowing third-party power purchase agreements (PPAs) for renewable energy while continuing to restrict the classes of customers who are allowed to have access to this important financing tool. In committee hearings, utility lobbyists claimed there was no need for the legislation because there is “plenty of room left” under the existing caps. Industry members testified that there is a lot more in the queue than is public, and caps will likely be reached this year. HB 1928 killed in Commerce and Labor subcommittee 3 by a 6-4 vote; Republican Tim Hugo voted with Democrats in support of the bill. SB 1460 killed in Senate Commerce and Labor 10-3, with only Democrats supporting. HB 2117 (Mullin) and SB 1584 (Sutterlein) fixes the problem that competitive service providers can no longer offer renewable energy to a utility’s customers once the utility has an approved renewable energy tariff of its own. Now that the SCC has approved a renewable energy tariff for APCo, this is a live issue. HB 2117 defeated in Commerce and Labor subcommittee 3 on party-line vote. Although the patron of SB 1584, David Sutterlein, is a Republican, his bill died in Senate Commerce and Labor 11-1, with only fellow Republican Ben Chafin voting for it, and Republican Stephen Newman abstaining. STILL ALIVE: HB 2165 (Davis and Hurst) and HB 2460 (Jones and Kory), and SB 1496 (Saslaw) provide an income tax credit for nonresidential solar energy equipment installed on landfills, brownfields, in economic opportunity zones, and in certain utility cooperatives. This is a Rubin Group bill. HB 2165 and HB 2460 remain stuck in the Committee on General Laws (not a good sign). SB 1496 was amended in Finance to change it from a tax credit to a grant-funded program, but with no money. Then it passed the committee unanimously. STILL ALIVE: HB 2192 (Rush) and SB 1331 (Stanley) is a school modernization initiative that includes language encouraging energy efficient building standards and net zero design. It also encourages schools to consider lease agreements with private developers (apparently there is one particular North Carolina firm that wants this). It does not contemplate the more common use of third-party power purchase agreements. HB 2192 was amended in General Laws, where it passed unanimously. It still has nice (but not mandatory) language on net zero schools. It allows leases with private developers who will construct and operate buildings and facilities. It permits public schools to contract with utilities for solar energy as part of the school modernization project. New language requires that renewable energy facilities must be on school property and cannot be used to serve any other property. PPAs are still not mentioned. Ambiguous language in these provisions may cause problems for schools. SB 1331 was amended with what appears to be the same language as its House counterpart. It reported unanimously from Finance. HB 2241 (Delaney) establishes a green jobs training tax credit. Failed in House Finance subcommittee on party-line vote. HB 2500 (Sullivan) establishes a mandatory renewable portfolio standard (RPS) for Virginia, eliminates carbon-producing sources from the list of qualifying sources, kicks things off with an extraordinarily ambitious 20% by 2020 target, and ratchets up the targets to 80% by 2027. Failed in Commerce and Labor subcommittee 3 with only Democrat Mark Keam supporting it. STILL ALIVE: HB 2547 (Hugo) and SB 1769 (Sturtevant) makes changes to the net metering program for customers of electric cooperatives. The overall net metering cap is raised from the current 1 percent to a total of 5%, divided into separate buckets by customer type and with an option for coops to choose to go up to 7%. Customers will be permitted to install enough renewable energy to meet up to 125% of previous year’s demand, up from 100% today. Third-party PPAs are generally legal, with a self-certification requirement. However, the coops will begin imposing demand charges on customers with solar, to be phased in over several years, replacing any standby charges. This bill was negotiated between the coops and the solar industry via the “Rubin Group.” You have to hand it to the coops, this is huge movement on their part, if not perfect, and it is too bad that Dominion and APCo held fast to their obstructionist position rather than allow their customers more freedom to install solar. An amendment to the bill establishes a stakeholder group for further discussions with Dominion and APCo on net metering, a prospect that will appeal only to eternal optimists and amnesiacs who don’t remember the past five years of time-wasting, fruitless negotiations. Delegate Hugo told me he tried to get Dominion and APCo to sign on to the coop deal but couldn’t persuade them—and I understand from others that he did make a real effort. But he scoffed at my suggestion that maybe Dominion shouldn’t have the final say. HB 2547 reported unanimously from Commerce and Labor. SB 1769 was amended to include the same stakeholder language requiring the mice to continue negotiations with the cat. It has now passed the Senate unanimously. STILL ALIVE: HB 2621 (Ingram) and SB 1398 (Stanley) authorize a locality to require the owner or developer of a solar farm, as part of the approval process, to agree to a decommissioning plan. This is a Rubin Group bill. An amended version of HB 2621 reported from Counties, Cities and Towns unanimously. SB 1398 was incorporated into SB 1091. HB 2641 (Gooditis) makes third-party power purchase agreements for distributed renewable energy resources legal statewide. Killed in Commerce and Labor subcommittee 3 by a 6-3 vote. Delegate Hugo, who had voted for Bulova’s narrower PPA bill, joined the other Republicans in voting against this broader one. HB 2692 (Sullivan) allows the owner of a multifamily residential building to install a renewable energy facility and sell the output to occupants or use for the building’s common areas. Stricken from docket. STILL ALIVE: HB 2741 (Aird) establishes a rebate program for low and moderate-income households that install solar. Amended so it retains the structure of the program but removes funding; otherwise it was going to be sent to Appropriations to die. As amended it was reported Commerce and Labor unanimously. STILL ALIVE: HB 2789 (O’Quinn) requires Dominion and APCo to apply for approval of three-year programs to incentivize low-income energy efficiency and solar totaling $25 million each. The efficiency spending comes out of the money utilities are required to spend under last year’s grid mod legislation. The solar spending is new money. Somehow I missed this bill in my earlier round-up. It passed the House 88-11. The nay votes are all Republicans: Adams, L.R., Byron, Cole, Fariss, Freitas, Gilbert, Landes, Poindexter, Wright, Brewer and LaRock. STILL ALIVE: HB 2792 (Tran) and SB 1779 (Ebbin) establishes a 6-year pilot program for municipal net metering for localities that are retail customers of investor-owned utilities. The initial bill negotiated with the utilities was predictably much more limited than most localities wanted; further amendments have left it useful for only a few small on-site projects that don’t need PPAs. Fairfax County supervisor Jeff McKay testified in committee it would do nothing to help the county’s projects.Tran presented the amended bill in committee just a day or two after coming under fire from conservative Republicans for a bill that would ease one restriction on late-term abortions. In an obviously orchestrated attempt to demonstrate that conservative middle-aged white men still wield the power in Richmond, Delegate Hugo said he needed time to read the amendment. Committee chairman Terry Kilgore obliged, saying they would come back to it. Kilgore then kept Tran waiting through several hours of other bills, many of which also had new amendments, before letting her bill come back up. (Proving once again that middle school has nothing on the General Assembly.) As amended, HB 2792 reported from Commerce and Labor 19-2, with only Republicans Hugo and Head voting no. HJ 656 (Delaney) would have the Virginia Resources Authority study the process of transitioning Virginia’s workforce from fossil-fuel jobs to green energy jobs. Failed to report from Rules subcommittee on party-line vote, all Republicans voting against it. STILL ALIVE: SB 1091 (Reeves) imposes expensive bonding requirements on utility-scale solar farms, taking a more drastic approach than HB 2621 (Ingram) and SB 1398 (Stanley) to resolving the concerns of localities about what happens to solar farms at the end of their useful life. SB 1091 was amended to conform to the compromise language of HB 2621 and has passed the Senate unanimously. We’re seeing modest progress in efficiency bills this year, mostly of the greasing-the-wheels variety. One of particular interest is Chap Petersen’s bill enabling Property Assessed Clean Energy (PACE) financing programs for residential buildings. HB 2243 (Sullivan) creates an energy efficiency revolving fund to offer no-interest loans to local government, public schools, and public institutions of higher learning. Killed in Appropriations subcommittee on party-line vote. STILL ALIVE: HB 2292 (Sullivan) and SB 1662 (Wagner), dubbed the “show your work bill,” requires the SCC to provide justification if it rejects a utility energy efficiency program. HB 2292 reported from Commerce and Labor with a substitute. SB 1662 passed the Senate with only 6 Republicans in opposition. STILL ALIVE: HB 2293 (Sullivan) establishes a stakeholder process to provide input on the development of utility energy efficiency programs. Reported unanimously from Commerce and Labor with a substitute. HB 2294 (Sullivan) establishes mandatory energy efficiency goals for electric and gas utilities. Killed in Commerce and Labor subcommittee 3 on party-line vote. HB 2295 (Sullivan) creates an energy efficiency fund and board to administer it. Killed in an Appropriations subcommittee on a party-line vote. STILL ALIVE: HB 2332 (Keam) protects customer data collected by utilities while allowing the use of aggregated anonymous data for energy efficiency and demand-side management efforts. Reported unanimously from Commerce and Labor with a substitute. SB 1111 (Marsden) requires utilities to provide rate abatements to certain customers who invest at least $10,000 in energy efficiency and, by virtue of their lower consumption, end up being pushed into a tier with higher rates. Stricken at the request of the patron. STILL ALIVE: SB 1400 (Petersen) removes the exclusion of residential buildings from the Property Assessed Clean Energy (PACE) program, which allows localities to provide low-interest loans for energy efficiency and renewable energy improvements on buildings. Passed the Senate unanimously. HB 2070 (Bell, John) provides a tax deduction for energy saving products, including solar panels and Energy Star products, up to $10,000. Stricken from docket in Finance subcommittee. Bills designed to push Virginia towards a clean energy future died in the face of unanimous Republican opposition. 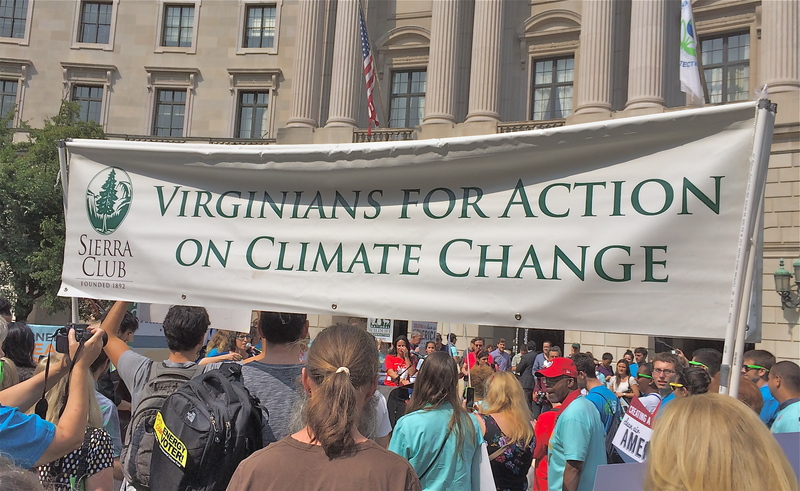 House Republicans also united to pass a bill prohibiting Virginia from implementing its carbon reduction plan. But in a faint nod to reality, most Republicans and Democrats support legislation to help southwest Virginia develop renewable energy and energy storage (as long as it doesn’t cost anything). HB 1635 (Rasoul, with 9 co-patrons) imposes a moratorium on fossil fuel projects, including export facilities, gas pipelines and related infrastructure, refineries and fossil fuel exploration; requires utilities to use clean energy sources for 80% of electricity sales by 2028, and 100% by 2036; and requires the Department of Mines, Minerals and Energy to develop a (really) comprehensive climate action plan, which residents are given legal standing to enforce by suit. This is being referred to as the “Off Act.” Defeated on the floor of the House 86-12. HB 1686 (Reid, with 14 co-patrons) and SB 1648 (Boysko) bans new or expanded fossil fuel generating plants until Virginia has those 5,500 MW of renewable energy we were promised. This is referred to as the “Renewables First Act.” HB 1686: Defeated in Commerce and Labor Subcommittee 3. 2 Democrats voted for it, 6 Republicans and 1 Democrat against. SB 1648 PBI’d 12-0 in Commerce and Labor. STILL ALIVE: HB 2611 (Poindexter) would prohibit Virginia from joining or participating in RGGI without support from two-thirds of the members of the House and Senate, making it sort of an anti-Virginia Coastal Protection Act. Passed the House on party-line vote. HB 2501 (Rasoul) directs the Division of Energy at DMME to include a greenhouse gas emissions inventory in the Virginia Energy Plan. Killed in Commerce and Labor subcommittee 3 on party-line vote. HB 2645 (Rasoul, with 13 co-patrons), nicknamed the REFUND Act, prohibits electric utilities from making nonessential expenditures and requires refunds if the SCC finds they have. It also bars fuel cost recovery for more pipeline capacity than appropriate to ensure a reliable supply of gas. Other reforms in the bill would undo some of the provisions of last year’s SB 966, lower the percentage of excess earnings utilities can retain, and require the SCC to determine rates of return based on cost of service rather than peer group analysis. Democrat Steve Heretick voted with Republicans to kill the bill in Commerce and Labor subcommittee 3. HB 2735 (Toscano) and SB 1666 (Lewis and Spruill) is this year’s version of the Virginia Coastal Protection Act, which would have Virginia formally join the Regional Greenhouse Gas Initiative (RGGI). It dedicates money raised by auctioning carbon allowances to climate adaptation efforts, energy efficiency programs, and coalfields transition. HB 2735 died in Commerce and Labor subcommittee 3 on party-line vote. SB 1666 met the same fate in Agriculture, Conservation and Natural Resources, with Democrat Rosalyn Dance abstaining. STILL ALIVE: HB 2747 (Kilgore) and SB 1707 (Chafin) create a Southwest Virginia Energy Research and Development Authority which will, among other things, promote renewable energy on brownfield sites, including abandoned mine sites, and support energy storage, including pumped storage hydro. HB 2747 reported unanimously from Commerce and Labor and was referred to Appropriations, where it passed with a substitute (presumably removing its fiscal impact, though I haven’t looked closely enough to confirm that). SB 1707 reported from Local Government and then from Finance, also with a substitute, presumably the same one. HJ 724 (Rasoul) is a resolution “Recognizing the need for a Green New Deal in Virginia which promotes a Just Transition to a clean energy economy through lifting working families.” This was referred to Commerce and Labor subcommittee 3, but there is no further information about it in the LIS. Bills that preserve, protect, and extend the monopoly power of our utilities are doing well. On the other hand, Dominion has so far failed to kill a bill strengthening the standards of review the SCC will use in considering whether to allow rate recovery for pipeline capacity. STILL ALIVE: HB 1840 (Danny Marshall) allows utilities to develop transmission infrastructure at megasites in anticipation of development, charging today’s customers for the expense of attracting new customers. Reported from Commerce and Labor with a substitute. Democrats Bagby, Heretick, Mullin and Bourne joined the Republicans in support. STILL ALIVE: HB 2477 (Kilgore) would eliminate one of the few areas of retail choice allowed in Virginia by preventing large customers from using competitive retail suppliers of electricity, including for the purpose of procuring renewable energy, in any utility territory with less than 2% annual load growth. A substitute bill in Commerce and Labor removes this language but replaces it with other requirements designed to make it difficult for large customers to leave the embrace of their incumbent monopoly. The substitute passed 15-2, with only Delegates Filler-Corn and Keam opposed. HB 2503 (Rasoul) requires the State Corporation Commission to conduct a formal hearing before approving any changes to fuel procurement arrangements between affiliates of an electric utility or its parent company that will impact rate payers. This addresses the conflict of interest issue in Dominion Energy’s arrangement to commit its utility subsidiary to purchase capacity in the Atlantic Coast Pipeline. Stricken from docket. STILL ALIVE: HB 2691 (O’Quinn) establishes a pilot program for electric utilities to provide broadband services in underserved areas, and raise rates for the rest of us to pay for it, proclaiming this to be in the public interest. A substitute bill has utilities only providing the capacity on their lines to private broadband suppliers, and makes the investment eligible for recovery as an electric grid transformation project (seriously! ), but prevents utilities from going into broadband services themselves. The amended bill passed Commerce and Labor unanimously. HB 2697 (Toscano) and SB 1583 (Sutterlein) supports competition by shortening the time period that a utility’s customer that switches to a competing supplier is barred from returning as a customer of its utility from 5 years to 90 days. HB 2697 died in House Commerce and Labor subcommittee 3 on a party-line vote, with all the Republicans voting against it. SB 1583 died in Senate Commerce and Labor 11-2, with only Republicans Newman and Chafin voting for it. Democrats Saslaw, Dance and Lucas joined the rest of the Republicans in demonstrating their Dominion-friendly bonafides. STILL ALIVE: HB 2738 (Bagby) and SB 1695 (Wagner) authorizes utilities to acquire rights of way on land that the Virginia Economic Development Partnership Authority decides could attract new customers to the site, and allows utilities to recover costs from existing customers. Because, you know, having utilities seize Virginians’ land for speculative development is already going so well for folks in the path of the pipelines. Who could complain about paying higher rates to help it happen more places? A substitute tightens the requirements somewhat without changing the basics. HB 2738 reported from Commerce and Labor 19-1 (Kory opposing, Keam abstaining). SB 1695 now has a similar amendment; it passed the Senate 34-6 and has been referred to House Commerce and Labor. The dissenting senators are an interesting mix of Rs and Ds: Chase, McPike, Newman, Peake, Spruill, and Suetterlein. SB 1780 (Petersen) requires, among other things, that utilities must refund to customers the costs of anything the SCC deems is a nonessential expenditure, including spending on lobbying, political contributions, and compensation for employees in excess of $5 million. It directs the SCC to disallow recovery of fuel costs if a company pays more for pipeline capacity from an affiliated company than needed to ensure a reliable supply of natural gas. It requires rate reviews of Dominion and APCo in 2019 and makes those biennial instead of triennial, and provides for the SCC to conduct an audit going back to 2015. It tightens provisions governing utilities’ keeping of overearnings and provides for the allowed rate of return to be based on the cost of providing service instead of letting our utilities make what all the other monopolists make (“peer group analysis”). Killed in Commerce and Labor 12-1, with only Republican Richard Stuart supporting the bill. I’m starting my review of 2015 energy legislation with a look at bills dealing with renewable energy and energy efficiency. Most of these bills will be heard in the committees on Commerce and Labor, though bills that cost money (tax credits and grants) usually go to Finance. Bills referred to Senate Commerce and Labor are heard by the full committee, which meets on Monday afternoons. It consists of 14 members: 11 Republicans and 3 Democrats. They form a tough lineup; none of these senators received better than a “C” on the Sierra Club’s Climate and Energy Scorecard. The House bills are typically assigned to the 13-member Special Subcommittee on Energy (10 Republicans and 3 Democrats, no fixed schedule). Bills that do not meet the approval of Dominion Power can expect a quick death here on an unrecorded voice vote, never to be heard from again. But on the plus side, the meetings are often quite lively, like old-fashioned hangings. Net metering is the policy that allows owners of solar (or other renewable) energy systems to be credited for the excess power they feed back into the grid when the systems produce a surplus; the owners use the credits when their systems aren’t supplying power and they need to draw electricity from the grid. Virginia law restricts who can use net metering, and how much. Expanding net metering is a major goal of renewable energy advocates, who argue it offers a free market approach to growth—give customers the freedom to build solar projects, get the utility out of the way, and solar will thrive. SB 833 and SB 764 (Edwards—apparently identical bills), HB 1950 (McClellan), and HB 1912 (Lopez) raise the maximum size of a commercial project eligible for net metering, from 500 kilowatts (kW) currently to 2 megawatts (MW). This is a much-needed expansion of the net metering program if Virginia is going to make real headway with solar. We are told Edwards plans to conform his legislation to HB 1622, below. HB 1622 (Sullivan) raises the maximum size of a commercial project to 1 MW, and the maximum size of a residential system from the current 20 kW to a whopping 40 kW. But note that it does nothing to limit the standby charges utilities can charge for residential projects over 10 kW. Given that these charges are so punitive as to kill the projects, raising the cap wouldn’t create new market opportunities unless it is accompanied by a limit on the amount of standby charges that utilities can tack on. HB 1911 (Lopez) amends the language allowing utilities to impose standby charges on residential and agricultural customers with systems over 10 kW to add the requirement that the State Corporation Commission conduct a “value of solar” analysis prior to approving the charges. Most solar advocates would rather see the legislature repeal the standby charge provision altogether, given how the utilities have abused it. Barring that, legislators should set a dollar limit of no more than five or ten bucks a month. But in the absence of any such reforms, it does make sense to at least require the SCC to do this more substantive analysis, ideally building on the framework developed over the summer by the Solar Stakeholder Group. HB 1636 (Minchew) establishes “community net metering” as well as increasing the commercial project cap to 2 MW. This bill is a high priority for the solar industry and the environmental community. It provides the solution for owners with shaded roofs, renters and others who can’t install solar themselves by letting them subscribe to a community generation facility in their own or a neighboring county. Other forms of renewable energy are also allowed, so residents in windy areas could go in on a small wind turbine that wouldn’t make sense for a single household. HB 1729 (Sullivan) creates “solar gardens” consisting of community organizations with 10 or more subscribers. The generation facility can be as large as 2 MW. The bill seems intended to accomplish much the same purpose as Minchew’s bill, although it is limited to solar. However, it allows the utility to impose “a reasonable charge as determined by the [State Corporation Commission] to cover the utility’s costs of delivering to the subscriber’s premises the electricity generated by the community solar garden, integrating the solar generation with the utility’s system, and administering the community solar garden’s contracts and net metering credits.” Boy, we’ve seen that movie before. Given what we’ve seen the SCC do with standby charges, the bill should be amended to put a cap on the amount of that “reasonable charge” so legislators know they aren’t writing a blank check. SB 350 (Edwards) authorizes programs for local governments to use net metering for municipal buildings, using renewable energy projects up to 5 MW. It also allows a form of community net metering targeted to condominiums, apartment buildings, homeowner associations, etc., with a renewable energy facility located on land owned by the association. These customers would be exempt from standby charges. HB 1925 (Lopez) and SB 1160 (Edwards) replace the current PPA program in Dominion territory with one that applies to both Dominion and APCo territories. It increases the project cap from the current 500 kW to 1 MW, and raises the overall program size to 100 MW from (50 MW). As with the current program, projects under 50 kW aren’t eligible unless the customer is a tax-exempt organization. HB 2219 (Yost) declares it to be in the public interest for Dominion Virginia Power or Appalachian Power to build up to 500 MW of solar power—a truly welcome objective—and authorizes the utilities to apply to the SCC for a certificate of public convenience and necessity for individual facilities of at least 20 MW in size, regardless of whether the facility is located in the utility’s own service territory. “In the public interest” are the magic words that push the SCC to approve something it might not otherwise. Both utility giants have shown an interest in building and owning utility-scale solar, even as they have taught the SCC to believe that solar owned by anyone else burdens the grid. The magic words let them escape the corner they backed themselves into. That would be necessary here, given that our SCC wrongly believes the public interest requires the lowest cost energy regardless of the consequences to public health, the environment, national security, and the economy. The solar industry has two concerns about HB 2219: the effect on ratepayers, since Dominion’s previous solar efforts have cost well above market rates; and the effect on the Virginia solar industry—or rather, the lack of an effect, since Dominion has hired only out-of-state companies. Virginia ratepayers could save money and the state could build more solar if legislation simply required the utilities to buy 500 MW of solar, and let the market decide who builds it. But of course, that’s now how things work in Virginia. I also think it is unfortunate that the bill allows utilities to build solar plants that are not in the utilities’ own service territories, and that it does not require them to use Virginia contractors. Surely there would be more support for a bill promising projects that support local economies with jobs and tax revenues, and that requires the hiring of local installers. These seem like small enough things to ask. This bill doesn’t require anything or make huge changes. It simply treats solar the way the Code currently treats other forms of generation, with the exception that the “in the public interest” language was previously used only to endorse a coal plant (what became the Virginia City Hybrid Energy Plant in Wise County). And note that this bill requires that the facility be in Virginia, and opens up the possibility of our utilities buying the facility rather than constructing it themselves, which could open the door to competition. This seems like a good way to proceed. HB 1728 (Sullivan) establishes a tax credit for renewable energy. Great idea, but last year the Senate Finance Committee made it clear they would not pass a new tax credit, so I assume this is a non-starter. Last year’s renewable energy tax credit bill was amended to create a grant program instead. It passed both houses, but without funding and with the requirement that it be passed again this year. It is back this year as HB 1650 (Villanueva). (It has been assigned to House Committee on Agriculture, Chesapeake and Natural Resources and is on the docket for 8:30 a.m. Wednesday, January 21. Odd: it ought to be in Finance.) The grant would equal 35% of the costs of a renewable energy facility, including not just wind and solar, but also things like biomass, waste, landfill gas, and municipal waste incinerators. Facilities paid for by utility ratepayers are not eligible, and the grant total is capped at $10 million per year. Prospects for the program aren’t great given the state’s tight budget situation, but the bill is a high priority for the solar industry. Another tax-related bill is HB 1297 (Rasoul), which authorizes localities to charge a lower tax on renewable projects than on other kinds of “machinery and tools.” Last year, you may recall, the solar industry was successful in getting passage of a bill that exempted solar equipment entirely from local machinery and tools taxes. Proponents are trying to ensure that Delegate Rasoul’s well-intentioned bill doesn’t reverse last year’s victory on solar. HB 1730 (Sullivan) establishes energy efficiency goals for electric and natural gas utilities. The good news: the goals are mandatory. The bad news: the goals are modest to a fault: a total of 2% energy savings by 2030 for electricity and 1% for natural gas. HB 1345 (Carr) extends the sales tax holiday for Energy Star and WaterSense products to include all Energy Star light bulbs; currently only compact fluorescent light bulbs are eligible. PACE (Property Assessed Clean Energy) is a way to finance energy efficiency, renewable energy and water conservation upgrades to commercial and non-profit-owned buildings. Local governments sponsor the financing for improvements and collect payments via property tax bills. Since the energy savings more than pay for the increased assessments, PACE programs have been hugely successful in other states. Last year a bill that would have let localities extend “service districts” to cover clean energy (PACE by another name) failed in the face of opposition from the banking industry. This year’s bills are also not labeled PACE bills, but they achieve the same end. Apparently the parties have worked out the problems, a hopeful sign that a multi-year effort will finally meet with success. SB 801 (Watkins) and HB 1446 (Danny Marshall) are companion bills that would authorize local governments to work with third parties to offer loans for clean energy and water efficiency improvements, creating “voluntary special assessment liens” against the property getting the improvements. The Department of Mines, Minerals and Energy would develop underwriting guidelines for local loans to finance the work. HB 1665 (Minchew) is similar, and we are told it will be conformed to HB 1446. HB 1725 (Bulova) and SB 1099 (Stuart) establish the Virginia Solar Energy Development Authority to “facilitate, coordinate, and support the development of the solar energy industry and solar-powered electric energy facilities in the Commonwealth.” This implements a proposal in the 2014 Virginia Energy Plan and is not expected to be controversial. HB 2075 (Toscano) requires the SCC to establish a registry for solar renewable energy certificates (SRECs). It would not suddenly make Virginia SRECs valuable, but it would put the administrative framework in place to support a voluntary SREC market, or even a real one if Virginia were to adopt legislation requiring utilities to buy solar power. A few bills would have a more sweeping effect on energy efficiency and renewable energy. HB 2155 (Sickles) is billed as an “Energy Diversity Plan.” It was supposed to be a “grand bargain” between utilities and the clean energy industries, with the McAuliffe administration participating as well, but we understand there are outstanding issues that make the bill’s future uncertain. The big idea is to put all non-emitting energy sources into one category: primarily wind, solar, hydro and nuclear, but also adding in combined heat and power, demand response and energy efficiency. The bill creates a timeline that requires utilities to ramp up use of new, non-emitting sources gradually, beginning with 0.25% of retail sales in 2016 and ramping up to 35% in 2030. The bill has the support of clean energy industries, but the idea of treating nuclear as a benign source of power on an even footing with efficiency and renewables concerns the environmental community. 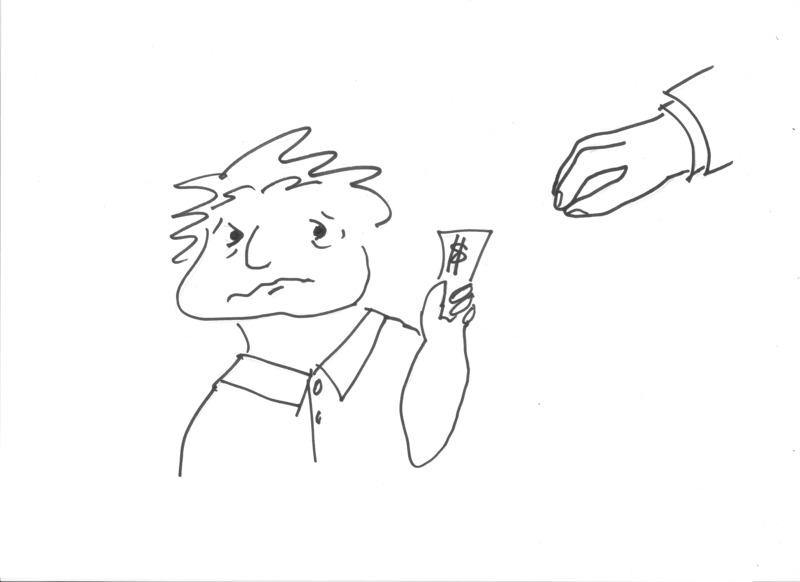 I’ll write more about this bill if it looks like it has legs. HB 1913 (Lopez) is the only bill of the bunch that directly targets Virginia’s Renewable Portfolio Standard (RPS). Maybe that shouldn’t be a surprise. Our RPS is a poor, sickly thing that most people have left for dead. To his credit, Lopez keeps trying. His bill keeps the RPS voluntary but beefs up the provisions to make the program meaningful, if a utility chooses to participate. Instead of mostly buying renewable energy certificates from things like old, out of state hydro dams, the bill would ensure that actual, real-world renewable projects get built. You know, what an RPS is supposed to do. In addition, the bill folds into the RPS the state’s existing goal of 10% energy efficiency gains by 2022. Utilities have done very little toward meeting this goal. Putting it into the voluntary RPS might be the prod needed to get more efficiency programs underway. Or it might cause a utility to drop out. Either way, the result would be better than what we have now, where Virginia pretends to have an RPS, and utilities pretend to care. Update: Another net metering bill has been filed. SB 1395 (Dance) raises the commercial net metering cap from 500 kW to 2 MW. In recent years paleontologists have come to believe that the dinosaurs did not go extinct; they evolved into today’s chickens and other birds. It turns out, however, that some of them did not evolve. Instead, they took jobs at Virginia’s State Corporation Commission. Now they’ve put their DNA on full display with comments they filed on the EPA’s Clean Power Plan. The proposed EPA rules, under section 111(d) of the Clean Air Act, would require states to reduce the power plant CO2 emissions driving climate change. The staffers assert primly that they “take no position on the broad policy issues,” but that they feel “compelled” to point out all the ways the plan is “arbitrary, capricious, unsupported, and unlawful.” These mostly boil down to their claims that the plan will force coal plant closures, raise rates significantly and threaten service reliability—claims experts say are badly off-base. Note that the commissioners themselves didn’t sign onto these comments. They come from the career staff at the Energy Regulatory Division, led by Bill Stevens, the Director, and Bill Chambliss, the General Counsel. This is pretty peculiar. I can’t think of a single other agency of government where the staff would file comments on a federal rulemaking without the oversight of their bosses. And really, “devastate”? But that’s the kind of hysteria you hear from opponents of the Clean Power Plan. While the rest of us see healthier air, huge opportunities for job growth in the clean energy sector, and the chance to avoid the worst effects of climate disruption, the Friends of Coal see only devastation. And no wonder: Howell accepted $14,000 from the coal industry just this year alone. We can all agree with the staff that nuclear plants are appallingly expensive. That may be why the EPA doesn’t assume most states will build them as part of their compliance strategy. To the contrary, the expectation is that states will respond with energy efficiency, wind and solar—all resources that are plentiful in Virginia but largely untapped so far. We have seen time and again that the SCC staff has never been friendly to either renewable energy or energy efficiency, so it’s no surprise that their comments dismiss them as unworkable. Indeed, it is clear from the comments they filed that their real interest is promoting an anti-EPA, pro-coal agenda. Otherwise it would be hard to understand why they would stray so far from their own area of practice to attack the very legality of the Clean Power Plan. Jaffe lists a number of other ways the SCC staff screwed up, but you get the picture: careful, reasoned analysis wasn’t the point. Still, you’d think that if agency staffers decide to go rogue like this, they would be careful to get the facts right. Update: I have heard from some sources that the SCC staff had the blessing of at least one commissioner in putting forth their comments, and that all three commissioners may have known. If so, that’s even worse. Virginians want wind and solar. Bummer, y’all. On May 20, the Georgia Public Service Commission signed off on two power purchase agreements that will add 250 megawatts (MW) of wind energy to the state’s electricity mix. This comes on top of earlier commitments to solar energy that, combined with the wind power, will give Georgia more than 1,000 megawatts of renewable energy capacity by 2016. While we certainly want to congratulate Georgia on its commitment to clean energy, the news has turned Virginia advocates a little green–and not in a good way. We can only wish this were us. Virginia has no wind energy to boast about, and about 15-18 megawatts of solar, according to estimates from the Department of Mines, Minerals and Energy. In Virginia, we have a few backyard turbines. Solar, for its part, keeps breaking records, with over 4,700 MW installed in 2013, a 41% increase over the previous year, and another 680 MW in the first quarter of 2014. Virginia solar broke into the double digits—bring out your horns and whistles!—thanks to the efforts of homeowners, colleges, the military, a few progressive towns and a handful of consumer-conscious businesses. As for our utilities, they have developed less than 1 MW of wind and solar in the Commonwealth. Oh, but Dominion Resources, the parent of Dominion Virginia Power, just bought a 7.7 MW solar project. In, um, Georgia. Changing to a local focus won’t help our case of envy. West Virginia doesn’t have much solar, but it has 583 MW of wind energy. North Carolina doesn’t have much wind, but it installed 335 MW of solar energy in the last year alone. Maryland is up to 142 MW of solar and 120 MW of wind. Tennessee—Tennessee!—has 29 MW of wind and 74 MW of solar. If we were shooting for last place among east coast states in the race to develop renewable energy, we might be able to congratulate ourselves. We are doing a great job of falling further and further behind. Sadly, Virginia, there is no consolation prize. If you’ve been following the woeful tale of Virginia’s renewable portfolio standard, by now you know it hasn’t produced a single electron of wind or solar power in the commonwealth, nor is it ever likely to. Fellow citizens, what is to be done? Let’s review what happened in last year’s legislative session, when word got out that Dominion Power was meeting the state’s renewable energy goals by buying cheap renewable energy certificates from decades-old projects involving dams, trash and wood—and collecting tens of millions of dollars annually as a “bonus” for doing so. Outraged environmentalists pushed for a reform bill that would let utilities collect this bonus from their customers only if they invest in new, Virginia-made wind and solar projects—essentially, what we thought the law was about in the first place. It was a well-crafted, solid, common-sense bill. It died without even a hearing. But meanwhile, Governor McDonnell got two bills passed that actually made the law worse. The first one said that in addition to energy from old dams, trash and wood, utilities can meet our goals by purchasing renewable energy certificates generated by universities showing they’ve done some research into renewable energy. Research is an admirable activity. Most of us approve of research. We approve of universities, too. But even when you put universities and research together, not a single electron of energy flows into anyone’s home. Under what possible theory does it qualify as renewable energy? Also newly qualifying, thanks to the governor, are certificates representing an industrial process used by a Virginia corporation called MeadWestvaco. This also won’t put energy on the grid, but it creates a brand-new income stream for MeadWestvaco, paid for by utility customers—though not by large industrial users like MeadWestvaco itself, which got themselves exempted from paying for the added cost to utilities of renewable energy. Lobbyists, my friends, are worth every dime of their inflated paychecks. No doubt this clever bill will stimulate the creative juices of other corporations to figure out how they, too, can feed at the renewable energy trough. As a service to anyone wondering how to get their ideas into law, I note that MeadWestvaco gave $75,000 to Bob McDonnell’s campaign for governor and his inaugural committee. This is what we call the Virginia Way. After these two bills passed, Governor McDonnell announced he had taken important steps to promote renewable energy. Advocates of renewable energy promptly asked him not to do us any more favors. Heading into the next session, we’re gravely concerned that he wasn’t listening. Attorney General Ken Cuccinelli offered a different approach: repeal the RPS law, or at least repeal the bonus utilities get. Mr. Cuccinelli is more famous for attacking the credibility of climate scientists than for embracing renewable energy, but with the environmentalists’ reform bill dead, the Sierra Club ended up supporting the AG’s bill rather than see the consumer rip-off continue. But that bill failed, too, though it got several votes from Cuccinelli allies in the House, some of whom are pretty sure that if renewable energy succeeds, the United States will become a failed socialist state occupied by blue-helmeted U.N. troops. (If you think I am making that up, check out some Virginia Tea Party websites.) It is safe to conclude that votes for the AG’s bill were not votes for renewable energy. Cuccinelli’s bill shared the same fatal flaw as the reform bill: Dominion Power opposed it. In case you haven’t caught on by now, Dominion almost always gets its way in the legislature, and it sure isn’t going to allow either the AG or the Sierra Club to take away its free money. The upcoming session could be interesting. Mr. Cuccinelli is running for governor next year, which makes him the leading Republican in the state, with all due respect to Bob “Lame Duck” McDonnell. This fall Cuccinelli issued a report critical of Virginia’s appalling RPS, and has signaled he plans to go after the bonuses again. Which is more powerful for Republicans, political allegiance or Dominion’s campaign cash? Which matters more to Democrats, renewable energy or Dominion’s campaign cash? Which matters more to Governor McDonnell, his party or his tight relationship with Dominion’s CEO (not to mention the campaign cash)? Not surprisingly, legislators are begging Dominion and the AG’s office to work something out together so they won’t have to pick sides. Concerned that a “compromise” may serve political ends but leave the public out in the cold, environmental groups plan to bring their own citizen’s army to Richmond in support of reform. They’d like to see a compromise that lets Dominion keep its bonus payments by earning them with Virginia-made wind and solar. It’s so little to ask–yet, based on past years’ experience, it may still be too much to hope for. Which brings us to the third option for outraged citizens. Buy Dominion stock. Seriously, if the company is going to wind up on top every time, you may as well get in on the profits. Maybe you can use your dividends to buy solar panels. 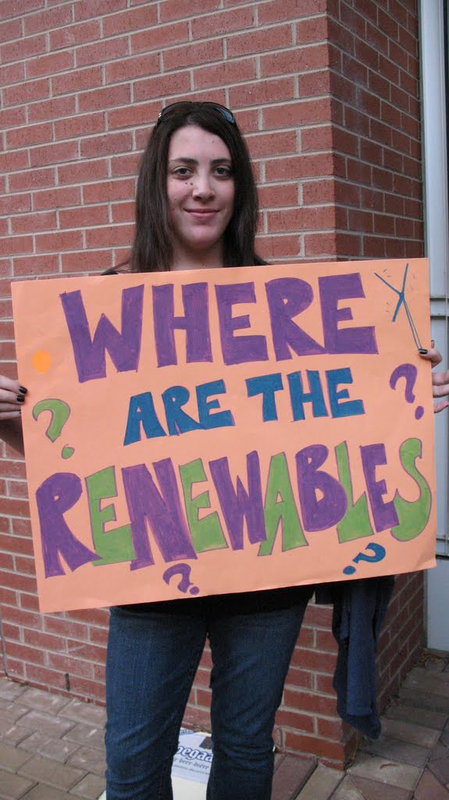 Greenwashing Virginia’s renewable energy law, part 1: Honey, I shrank the goals! Criticism of Dominion Virginia Power has been steadily mounting over the $76 million dollars the company has been awarded as a “bonus” for complying with Virginia’s voluntary renewable energy law. Last week Attorney General Ken Cuccinelli weighed in with a report echoing the charges environmentalists have been making for the past year: Dominion has succeeded in meeting the letter of the law, and collecting bonus money from its customers, without investing in any new renewable energy projects. The AG’s office exonerates Dominion, claiming the real failure is the legislature’s for passing a law that allowed this to happen. Silly Mr. Cuccinelli: this is Virginia. Dominion wrote the law. But it’s worse than you know. The money-for-nothing issue is partly a result of the statute’s failure to require new investments in high-value projects like wind and solar energy as a condition of earning the bonus, but it is also a function of the extremely modest targets set by the statute itself. Virginia’s renewable energy goal is usually stated as 15% renewable energy by 2025, but when 2025 rolls around, the goal will be met with less than half this percentage, possibly much less. The greenwash works like this: the statute sets a 2025 target for renewable energy to make up 15% of “total electric energy sold.” You probably think you know what “total electric energy sold” means. You don’t. Only if you are whiling away an idle afternoon reading the definitions section of the statute do you learn that “total electric energy sold” is defined as the total amount of electricity sold, minus the amount provided by nuclear power. In the case of Dominion Power, nuclear is about a third of the total. So for Dominion, 15% of “total electric energy sold” actually means only 10% of its electricity sales. Yet even if this statement said Dominion would get 15% of its “non-nuclear power” from renewable energy by 2025, it would still be wrong. When 2025 arrives, meeting the goal won’t require Dominion to achieve anywhere near 15% of its non-nuclear sales (10% of total) from renewable energy. That’s because the target percentage is measured against 2007 sales, not 2025 sales, and Virginia is growing. Assuming sales increase a little under 2% per year as Dominion projects, by the time 2025 rolls around, meeting the goal will require only about 7% renewables. If Dominion builds the new nuclear plant it wants, that number will shrink further. Conceivably the number could go even lower. Since 2007, Virginia politicians have twice demonstrated how much they love renewable energy by watering the goal down even further, but doing it in a way that makes it sound awesome. They passed bills that say utilities will get double credit for any wind and solar they use to meet the goal. In fact—what the heck—if they build offshore wind farms, we’ll give them triple credit! Wow, triple credit! That’s great! Isn’t it? Come to think of it, no. Combine that with the other sleights-of-hand, and now Dominion could satisfy Virginia’s entire 15% renewable portfolio goal with about 3.5% of our electricity coming from solar energy or wind farms on land. For offshore wind, less than two and a half percent would do it. And that’s thirteen years from now. Chances are, this doubling and tripling will never matter. Dominion “earned” its $76 million bonus for meeting the letter of the law with electricity from old dams and biomass (i.e., wood-burning), and by buying cheap credits from out of state. Dominion can get enough of this cheap renewable energy that it will be able to meet the goals through 2025 without investing in wind and solar. Given Dominion’s approach to meeting the goals, it might be just as well that the target is so low. But then you have to wonder: $76 million for that? For much of the past year, critics have been assailing Dominion Power for its “$76 million rip-off”: a bonus the company claimed for meeting Virginia’s renewable energy goals using old dams, trash and wood, much of it out of state. Environmental groups say Dominion should get a bonus only if the company invests in new wind and solar projects in Virginia. Attorney General Ken Cuccinelli says utilities shouldn’t get bonuses for renewable energy at all. Reporters were left scratching their heads. A year ago the State Corporation Commission, which regulates Virginia utilities, determined that the company has “earned” the $76 million bonus by meeting the absurdly lax terms of the state’s renewable energy law. (See SCC case PUE-2011-00027.) So if customers aren’t paying, how is Dominion collecting? But of course, customers are paying, and you can bet Dominion intends to get every dime. To understand how this can happen, imagine that you hire a contractor for a long-term project. You agree to pay her a set amount every month. Out of your payments, the contractor will take her expenses and profit, and when she meets a particular goal, she can take out a bonus as well. At the end of two years, you will recalculate your monthly payments to ensure the contractor recoups anything still owed to her, as well as to cover what she is entitled to going forward—expenses, profit and bonuses—and the work will continue. On the other hand, if the rates don’t bring in enough revenue to cover expenses and profit, they will be reset at a higher level for the next rate period. One way or another, the utility get its money. So Dominion’s lawyerly response to critics turns out to be both correct, and irrelevant. Utility rates are currently frozen, but that tells us nothing about whether the company is collecting its bonus. And if Dominion does not collect the full $76 million before the end of 2013, it will be one of the “factors that affect the SCC setting our rates going forward.” That is, rates will be set to ensure Dominion collects the full amount. Sorry, ratepayers. The rip-off continues.